You are currently browsing the tag archive for the ‘parenting’ tag. So I bought my first parenting book. For someone who loves reading so much I’m not reading anything about pregnancy: I browsed through What to Expect When You’re Expecting and The Best Friends’ Guide to Pregnancy, but mostly my partner just gives me the highlights. He’s the one keen on knowing all the details. For me, between pre-natal classes, doctor’s appointments and conversations with friends I feel I’ve all the information I need without stressing about everything that can happen. But parenting is much more intellectually appealing. I don’t mean the technical details about schedules, potty-training and feeding, but the ones about raising happy, honest, confident, connected, fulfilled people. I’ve been thinking about it a lot, mostly about how I was raised, what I’d try to copy, what I’d change, and the kind of parent I’d like to be. I try not to think too much about the person I’d like my son to be because it might be unfair to him (although we got excited about raising an Olympic champion during the Games… and what if – gasp! – he’s not A Reader?!). I am curious about all the theories out there but also don’t want to read too many parenting books. I know the conflicting information can be daunting. Some titles however, are impossible to resist, like How Children Succeed: Grit, Curiosity, and the Hidden Power of Character. (…) success today depends primarily on cognitive skills — the kind of intelligence that gets measured on I.Q. tests, including the abilities to recognize letters and words, to calculate, to detect patterns — and that the best way to develop these skills is to practice them as much as possible, beginning as early as possible. (…) noncognitive skills, like persistence, self-control, curiosity, conscientiousness, grit and self-confidence, are more crucial than sheer brainpower to achieving success. I first heard about it in a forgotten list of 2012 notable books and the premise really struck a chord as my experience also tells me that IQ is overrated. I haven’t read the book yet, but I hope that with “success” Tough means much more than financial or career paths, which my experience also tells me is only a part of the success equation. 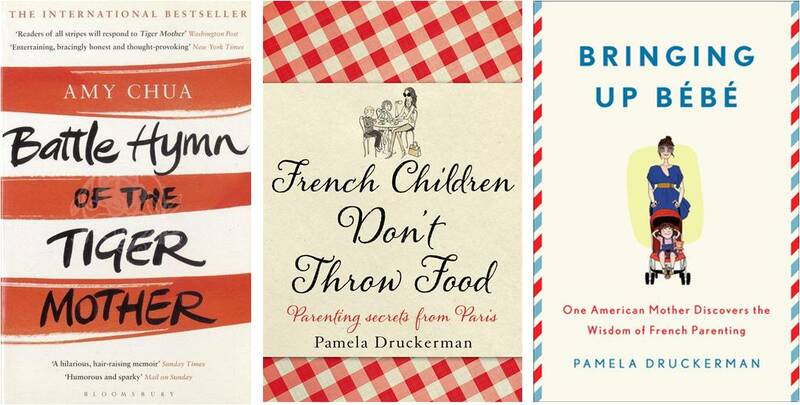 I’m also oddly attracted to all the culture-specific books, like Battle Hymn of the Tiger Mother or the French-loving ones such as French Children Don’t Throw Food and Bringing Up Bébé (interesting article Why the French don’t need parenting books). This probably happens because I live in a very international environment, with lots of double-nationality babies and different ways of raising them. One of the most popular conversation subjects in Brussels is how to best raise a bi-, tri- or tetra-lingual baby (e.g. Portuguese mom and Polish dad who speak English among themselves, kid in a French- or Dutch-speaking nursery). It’s all fascinating, although I have the feeling that gut-feeling, pure instinct (and maybe trial-and-error?) will put all theories in a corner when push comes to shove. Do you have any favorite parenting book? I’d be really interested in your input!